Grab your friends, your kayaks and canoes, and get ready to paddle through a wonderland in the Finger Lakes. 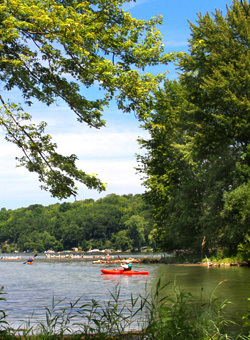 Cayuga County offers some great kayaking along the Owasco Inlet on the Owasco Flats. The Owasco Flats Nature Reserve is holding a free event on Saturday, June 8th, 2013 at 10 a.m. If you don’t have your own canoe or kayak, arrive early and you can rent a boat at the South Shore Marina. A white butterfly close enough to kiss, and then a small dragonfly with gossamer wings rode on my kayak with me. Together we paddled along the ribbon of water under low branches to the entrance of a beaver dam. When we turned right the dragonfly flew off. Jan and I continued south between tall ferns, and noticed a wooden bird house that was two-feet tall for wood ducks. With bumpy logs lurked just below the surface, while a monarch butterfly looped overhead, we navigated around bends, our paddles making the slightest sounds. Cars could be heard off in the distance but where we were--there were dragonflies, birds chirping and all was quiet except for when--a large fish jumped so high beside my boat--I jumped and let out a Holy Toledo!